There are nearly 300 recorded mammal species in Myanmar. Of this number, gibbons stand out because of their ability to vocalise beautiful natural songs. This ability is an almost irresistible attraction to tourists who are interested in wildlife and nature. Sometimes referred to as “forest engineers” because they disperse seeds in the forest, gibbons are key indicator species for conservation. In Myanmar, one of the few countries in the world where gibbons are found, there are three species – the eastern hoolock gibbon, western hoolock gibbon, the lar gibbon and white-handed gibbon. Of the three species, the western hoolock gibbon and the lar gibbon are categorised as endangered on the International Union for Conservation of Nature’s red list. The eastern hoolock gibbon is categorised as vulnerable. The western and eastern hoolock species are divided territorially by the Chindwin River. 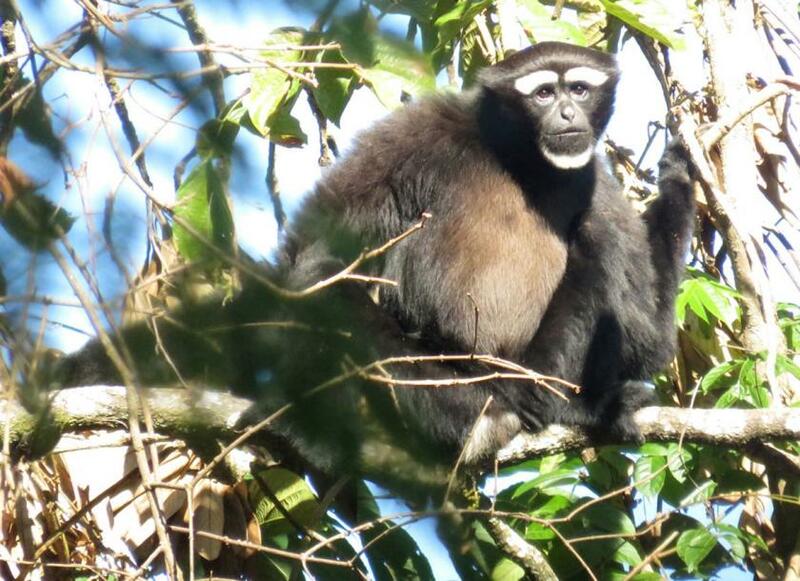 The main threats to gibbons in Myanmar are overexploitation of forests, illegal hunting, and mining. According to the Wildlife Conservation Society (WCS), all this is causing the country’s gibbon population to drop. “Gibbons in Myanmar also face the threat of being captured and sold as pets,” said Ko Htet Wai Aung, a project assistant at WCS Myanmar. “People believe that if gibbons vocalise in the morning, the weather for the day will be pleasant, but if they sing in the evening the weather will change,” said Ko Htet Wai Aung. “We can hear their songs from as far as six kilometers away, and it can be very pleasant,” said Ko Moe Aung, a resident in Putao. The eastern hoolock gibbon is normally found in territory east of the Chindwin River. Populations of the species can be found in the Hponkanrazi Wildlife Sanctuary, Hukaung Valley Wildlife Sanctuary, Htamanthi Wildlife Sanctuary and Mahamyaing Wildlife Sanctuary. The species’ territory extends into China. The western hoolock gibbon can be found in Hukaung Valley Wildlife Sanctuary, the Naga Range, the hills of Chin State and Rakhine State and parts of India and Bangladesh. Lar gibbons can be seen in southern Myanmar and Shan State. They are also found in Thailand, Laos, and Indonesia. “Some people believe eating the head of a gibbon will cure headaches. A live gibbon can fetch as much as K100,000. It is difficult to arrest poachers, some of whom will even take baby gibbons. This puts the population under even more pressure,” Ko Moe Aung says, adding that gibbons play an important role as indicators of forest health and are crucial for sustainable eco-tourism. Ko Htet Wai Aung agreed, saying a healthy gibbon population can lead to better tourism development. At present, gibbon conservation is actively carried out in Hponkanrazi Wildlife Sanctuary in Putao district, Kachin Satate. The programme has been jointly run by the scientific journal Nature, Myanmar’s Wildlife Conservation Division and the WCS since last May. The project is also supported by international environmental organisation Global Environment Facility, said WCS officials. “Gibbon population surveys can contribute to the better management of wildlife sanctuaries since the numbers are a clear indicator of the health of the forest ecosystem in a sanctuary and the level of illegal hunting,” said U Thein Htay, a park warden at Hponkanrazi Wildlife Sanctuary.